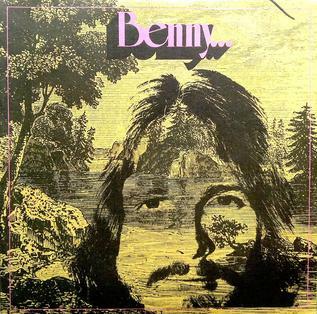 Benny Hester is most famous for evangelical Christian hits like 'When God Ran' and, were it not for a studio warehouse fire, would no also be know for this album. Bennie… was made with Elvis Presley’s Vegas backing band, including Jerry Scheff and James Burton. Only a few copies survived and were traded round in the hands of collectors for years. During the making of this album, Hester was experiencing a religious awakening and the album is filled with an inspired energy. Not that he’s bible-thumping at you. Far from it. Vocally, Hester is an elfin, helium-pitched tenor in line with Leo Sayer, with a phrasing that sometimes brings Elton John to mind. 'Give Your Love Forever' is a rousing start, with some crackling guitar courtesy of the legendary James Burton. “No, The End Is Not Near” features intimate Folksy verses and a rousing Pop chorus. “Love Never Dies” is a haunting, heavily orchestrated ballad reminscent of Bill Fay and Nick Garrie. It also features another fiery solo by Burton. “The Bridge” brings more of the same. “We All Know He Is Coming” is an unapologetic advertisement for Jesus and frankly is a bit corny with its clichéd angelic choir. It’s one saving grace, again, Burton’s inspired guitar. “The Painter” is a pleasant bit of Psyche Folk Country. Also a bit corny. The album’s quirkiest Beatlesque moment is the romping, “Malcolmbe”. For my money, one of the most mesmerizing tracks on the album. In contrast “What’s Happened to My Friends” is a straightforward slice of Folk Rock. Despite, its flute solo, it’s the album’s most radio friendly track. “Please Let This Be So” is the most stripped down and acoustically driven ballad. At times, it brings Chris Bell’s solo, post Big Star recordings to mind. The album closes with the achingly beautiful, “Genevieve”. For fans of heavily orchestrated long lost Psyche Folk masterpieces like Bill Fay and Nick Garrie’s The Nightmare of J. P. Stanislas, Benny… is another one to add to your collection.